THE SKINNY: It made me cringe to spend $24 on an eye liner. But Benefit's They're Real Push-Up Eye Liner isn't just any liner. This gel liquid is the real deal. It goes on easy -- you do need a steady hand -- and makes eyes look big and bold. It feels like mascara ... in a liner. It goes on unlike any other eyeliner I have ever tried. 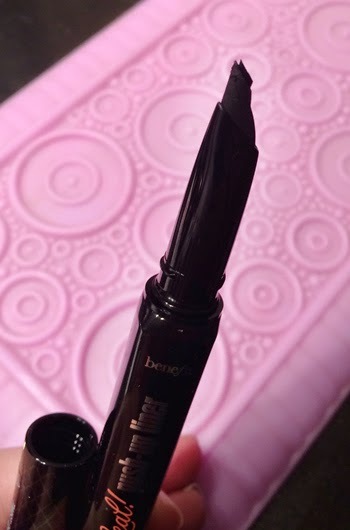 The applicator has a flexible rubber tip and the product comes up through it. One click will go all the way across you lids. This stuff lasts all day and looks like it just went on. It dries exceptionally fast (so you don't end up with smudges) and is waterproof. If you want to try some of the funkier eye liner styles of there (exaggerated cat eyes or just high drama), this is a great solution. The only downside is that it only comes in black. CHECK IT OUT: Check out Benefit's liner looks and buy online.